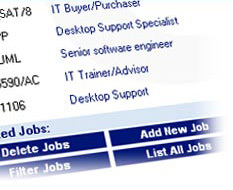 CPI JobStar is a complete website package that allows you to create your own jobboard. The look and feel of the site can be quickly and easily tailored to match the visual style of your main brochure website, including the main colours, logos and banners. CPI JobStar provides your recruitment agency with a sophisticated portal to advertise new jobs and attract applicants. Equipped with a rich set of features and tools for your applicants, the JobStar complements your main site with a fully functional job board that goes beyond the standard search-and-list functionality offered by most recruitment agency websites. CPI JobStar is offered as an ASP solution, and is individually hosted and linked to your main brochure website. CPI JobStar is an application still in work. Some of the features mentioned below are not yet available. JobStar is an indispensable product for recruitment agencies that that would like to have an interactive on-line database powered site for advertising jobs. It is also preferred by agencies whose existing site does not offer advanced tools and value-added services to applicants. 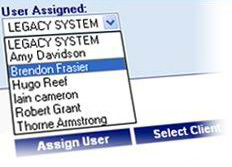 JobStar is an off-the-shelf product that can be implemented within days of order. Once your company has its own portal installed, your web-site will become a powerful, comprehensive and easy to use on-line job board. Applicants will be able to search or browse the database using five different methods. 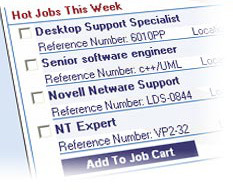 They can add suitable jobs to their Job Cart and at the end apply for all of them at once. A rich set of additional value-added services are available to registered users, making your site a preferred recruitment destination. JobStar is an integrated product that will complement your web-site with a searchable on-line database of jobs. Applicants will be able to search, and apply for jobs with or without registering. The applicant can select any number of jobs from any number of searches before applying. A wizard guides the applicant through the application process with the following options. Applicant can apply for the selected jobs without registering. In this case, they will only be asked for their name, email and Resume Word document. Applicant can register and apply. In this case, they will be presented with an application form to complete, which will request comprehensive details from the user as well as their Resume Word document. Applicant can login and apply. If they have already registered previously, they simply enter their user name and password and system accepts the new jobs they are interested in. Registered applicants can view at any time the complete list of all jobs that they have applied for in the past. The consultants will be automatically sent an email by the system with details of all applicants who have applied for jobs that belong to them. Further, the consultants can login and view an online list of all applicants who have applied for any jobs that belong to them. JobStar has powerful content management capabilities allowing your designated site administrator to easily edit and update almost anything – from banners and links to your greeting message and company information. Administration of consultant profiles, jobs and applicants is also conducted via the web-browser. No technical knowledge is required. If you can use a web-based e-mail system, you know enough to administer this portal. Administration of applicants and agency consultant accounts. Administration of posted jobs and applicants. Administration of the site’s static and dynamic content, including site colors, banners, news, hot jobs and greeting messages, ensuring the site is kept exciting and up-to-date, making each visit a unique experience. JobStar has an extensive e-mail notification system, which channels the appropriate information from the site to the respective recruitment consultants. 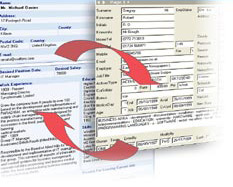 This dramatically improves document- and time-management, while reducing the risk of errors. Automatic posting of jobs to the portal. Processing of new applicants’ registration details, submitted through the portal. Updating applicants' registration details and on-line summary details.